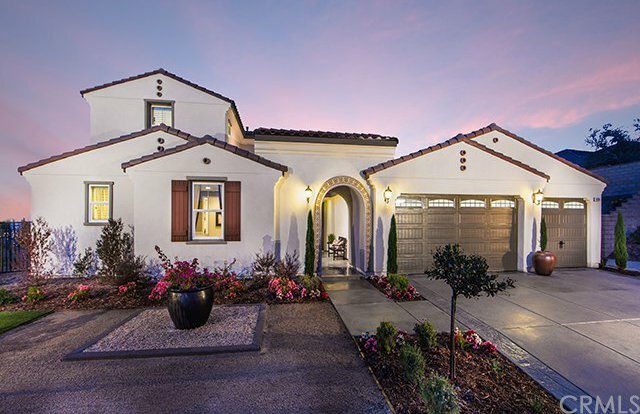 *MOVE-IN READY HOME WITH LOW MONTHLY PAYMENTS* Luxurious brand new home that lives as a single story. A courtyard welcomes you into the formal entry with vaulted ceilings that expands through the dining room and great room. Multi-slider doors bring the outdoors in with a convenient outdoor living room where you could entertain family and friends. The kitchen hosts an oversized island which easily accommodates a large group for dining & entertaining. Modern appointments and an oversized walk-in pantry make this kitchen a chef's dream. Adjacent to the kitchen is a morning room that features flex space as a casual dining area or family room. A private hallway leads to the spacious downstairs master suite and includes a spa-inspired bath with a large soaking tub and grand shower, walk-in closet, dual vanities and dressing table. Two secondary bedrooms feature private baths and a powder room for guests complete the downstairs. Upstairs you will find two additional bedrooms with a jack and jill bath along with a study boasting views of the beautiful foothills. This home features upgraded countertops and flooring throughout. Added amenities include 4 car garage, tankless hot water heater, laundry sink and whole house fan. Bella Vista's community has a LOW TAX RATE and No HOA! *Pictures of model home, not actual home. Listing sold by Emily Griffin from Griffin Real Estate, Inc.